One example of a recent successful breakout trade is medical application and equipment player Arrhythmia Research Technology (HRT, which I featured in May 9's 5 Stocks Ready for Breakouts at around $5.20 share. I mentioned in that piece that shares of Arrhythmia Research Technology were gapping up sharply higher back above its 50-day moving average with strong upside volume. That spike was quickly pushing shares of HRT within range of triggering a big breakout trade above some near-term overhead resistance levels at $5.30 to $5.48 a share. Guess what happened? Shares of HRT didn't wait long to trigger that breakout, since the stock ripped higher above those key resistance levels on May 13 with above-average volume. Shares of HRT tag an intraday high on last Friday of $6.46 a share, which represents a sharp gain of 25% from my original article. Shares of HRT are starting to enter overbought territory, since its relative strength index reading is now 80. That said, the stock looks likely to re-test or possibly take out its 52-week high of $6.98 a share in the very near future. 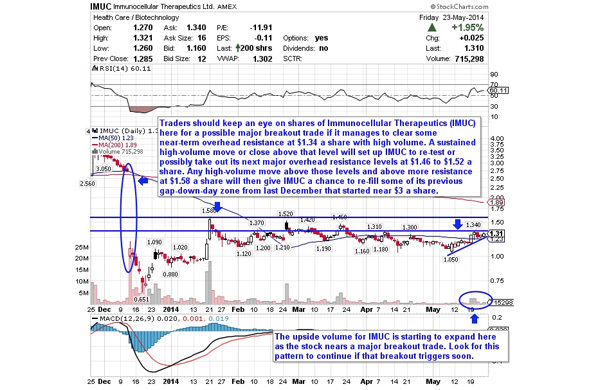 One small-cap biotechnology player that's starting to move within range of triggering a major breakout trade is ImmunoCellular Therapeutics (IMUC, which develops immune-based therapies for the treatment of brain and ovarian cancers. This stock is off to a hot start in 2014, with shares up sharply by 41%. If you take a look at the chart for ImmunoCellular Therapeutics, you'll notice that this stock has been trending inside of a large range for the last four months, with shares moving between $1.05 on the downside and $1.58 on the upside. Shares of IMUC have now started to rebound off its recent $1.05 low and it's crossed back above its 50-day moving average of $1.23 a share. Shares of IMUC are now starting to spike higher off its 50-day moving average and it's quickly moving within range of triggering a major breakout trade. Traders should now look for long-biased trades in IMUC if it manages to break out above some near-term overhead resistance at $1.34 a share with high volume. Look for a sustained move or close above that level with volume that hits near or above its three-month average action of 1.12 million shares. If that breakout materializes soon, then IMUC will set up to re-test or possibly take out its next major overhead resistance levels at $1.46 to $1.52 a share. Any high-volume move above those levels and above more resistance at $1.58 a share will then give IMUC a chance to re-fill some of its previous gap-down-day zone from last December that started near $3 a share. Traders can look to buy IMUC off weakness to anticipate that breakout and simply use a stop that sits right below its 50-day moving average of $1.23 a share or around more near-term support at $1.15 a share. 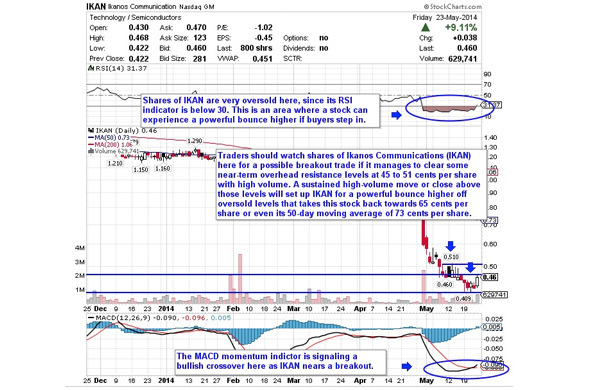 One can also buy IMUC off strength once it starts to clear $1.34 a share with volume and then simply use a stop that sits a comfortable percentage from your entry point. A leading entertainment and media player that's starting to trend within range of triggering a big breakout trade is World Wrestling Entertainment (WWE - Get Report), which is engaged in the sports entertainment business worldwide. This stock has been slammed hard by the short-sellers so far in 2014, with shares down sharply by 32%. If you take a look at the chart for World Wrestling Entertainment, you'll notice that this stock gapped down huge recently from over $20 to $10.55 a share with massive downside volume. Following that move, shares of WWE have started to trend sideways a bit and so far the stock has held that recent low of $10.55 a share. Shares of WWE are now starting to spike higher off that $10.55 low and it's quickly moving within range of triggering a major breakout trade that could take the stock back into its massive gap. Traders should now look for long-biased trades in WWE if it manages to break out above its gap-down-day high of $11.93 a share with high volume. Look for a sustained move or close above that level with volume that registers near or above its three-month average action of 2.64 million shares. If that breakout gets underway soon, then WWE will set up to re-fill some of its previous gap-down-day zone that started just above $20 a share. 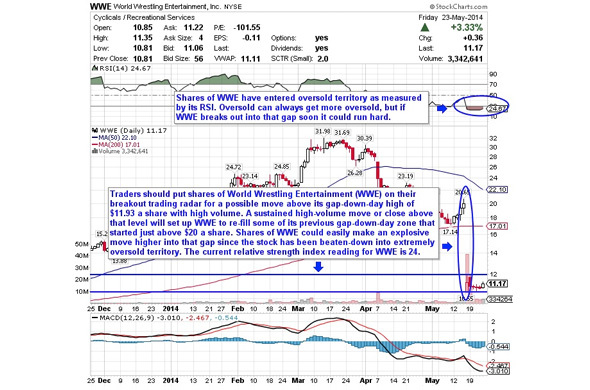 Shares of WWE could easily make an explosive move higher into that gap since the stock has been beaten-down into extremely oversold territory. The current relative strength index reading for WWE is 24.6, which indicates an extreme oversold reading. Traders can look to buy WWE off weakness to anticipate that breakout and simply use a stop that sits right below its recent low of $10.55 a share. One could also buy WWE off strength once it busts above $11.93 a share with strong volume and then simply use a stop that sits a comfortable percentage from your entry point. Another communication player that's starting to move within range of triggering a near-term breakout trade is Ikanos Communications (IKAN, which designs, develops, markets and sells semiconductors and integrated firmware products for the digital home worldwide. This stock has been destroyed by the sellers over the last six months, with shares down sharply by 61%. If you take a glance at the chart for Ikanos Communications, you'll notice that this stock has been downtrending badly for the last six months, with shares falling from over $1.30 to its recent low of 41 cents per share. During that downtrend, shares of IKAN have been consistently making lower highs and lower lows, which is bearish technical price action. That huge beat-down and recent gap-down has now pushed shares of IKAN into extremely oversold territory, since its current relative strength index reading is 31.3. Oversold can always get more oversold, but it's also an area where a stock can experience a powerful rebound higher from. Traders should now look for long-biased trades in IKAN if it manages to break out above some near-term overhead resistance levels at 47 to 51 cents per share with high volume. Watch for a sustained move or close above those levels with volume that registers near or above its three-month average action of 296,969 shares. If that breakout starts soon, then IKAN could set up for a powerful bounce higher that takes this stock back towards 65 cents per share or even its 50-day moving average of 73 cents per share. Traders can look to buy IKAN off weakness to anticipate that breakout and simply use a stop that sits right below its recent 52-week low of 41 cents per share. One can also buy IKAN off strength once it starts takes out those breakout levels share with volume and then simply use a stop that sits a comfortable percentage from your entry point. Another biotechnology player that's starting to move within range of triggering a major breakout trade is InterMune (ITMN, which focuses on the research, development, and commercialization of therapies for pulmonology and orphan fibrotic diseases in North America and Europe. This stock has been absolutely on fire so far in 2014, with shares up gigantic by 171%. If you look at the chart for InterMune, you'll notice that this stock has been uptrending strong for the last month and change, with shares moving higher from its low of $24.27 to its new 52-week high of $40.13 a share. That new 52-week high was made on an intraday basis last Friday, and shares of ITMN pulled back slightly from that high to close at $39.98 a share. This strong technical action could be signaling that ITMN is in the early stages of triggering a major breakout trade. Traders should now look for long-biased trades in ITMN if it manages to break out above its new 52-week high of $40.13 a share with high volume. Look for a sustained move or close above that level with volume that registers near or above its three-month average volume of 3.77 million shares. 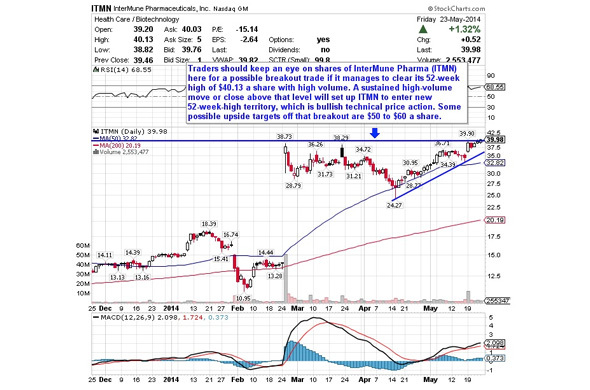 If that breakout kicks off soon, then ITMN will set up to enter new 52-week-high territory, which is bullish technical price action. Some possible upside targets off that breakout are $50 to $60 a share. Traders can look to buy ITMN off weakness to anticipate that breakout and simply use a stop that sits right below some near-term support at $37.50 a share, or right around its uptrend line support just above $35 a share. One can also buy ITMN off strength once it busts into new 52-week-high territory above $40.13 a share with volume and then simply use a stop that sits a comfortable percentage from your entry point. 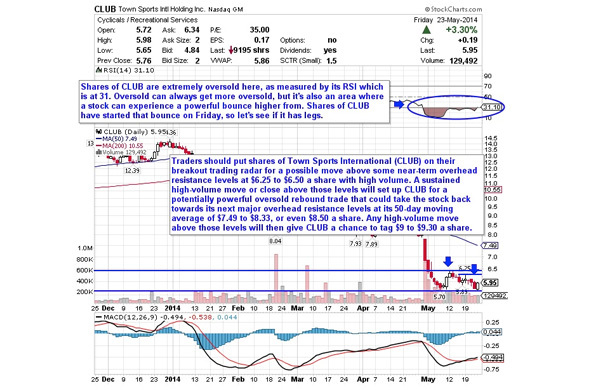 My final breakout trading prospect is sporting activities player Town Sports International (CLUB - Get Report), which owns and operates fitness clubs in the Northeast and Mid-Atlantic regions of the U.S. This stock has been crushed by the bears so far in 2014, with shares down a whopping 59%. If you look at the chart for Clown Sports International, you'll see that this stock has been downtrending badly for the last six months, with shares sliding lower from over $14 a share to its recent 52-week low of $5.65 a share. During that downtrend, shares of CLUB have been consistently making lower highs and lower lows, which is bearish technical price action. That said, shares of CLUB have now started to form a potential bottoming chart pattern at around $5.65 to $5.90 a share. Shares of CLUB have now started to bounce off those levels and it's quickly moving within range of triggering a big breakout trade above some key near-term overhead resistance levels. Traders should now look for long-biased trades in CLUB if it manages to break out above some near-term overhead resistance levels at $6.25 to $6.50 a share and then once it clears more key resistance at $6.75 a share with high volume. Look for a sustained move or close above those levels with volume that registers near or above its three-month average action of 161,444 shares. If that breakout starts soon, then CLUB will set up to re-test or possibly take out its next major overhead resistance levels at its 50-day moving average of $7.49 a share to around $8.50 a share. Any high-volume move above $8.50 will then give CLUB a chance to tag its next major overhead resistance levels at $9.36 to its 200-day at $10.55 a share. Traders can look to buy CLUB off weakness to anticipate that breakout and simply use a stop that sits right below its recent 52-week low of $5.65 a share. One can also buy CLUB off strength once it starts to take out those breakout levels with volume and then simply use a stop that sits a conformable percentage from your entry point.